The diversity of images of Jesus in the New Testament . . . The diversity of images of Jesus in the New Testament is indeed dazzling … None of them captures all of Jesus; none is without some truth concerning Jesus. We are incredibly enriched precisely by their abundance and diversity, and we would be impoverished by the loss of any of them (198). Luke Timothy Johnson so concludes in his book Living Jesus: Learning the Heart of the Gospel (San Francisco: Harper, 2000), a sequel to his The Real Jesus: The Misguided Quest for the Historical Jesus and the Truth of the Traditional Gospels (San Francisco: Harper, 1997). In the latter Johnson not only tore apart the method and conclusions of the Jesus Seminar, but also laid out his view that the entire quest for the historical Jesus is basically irrelevant, especially to Christians. Living Jesus is Johnson’s response to the question of what is relevant for Christians when it comes to Jesus, and for him it comes to us in two parts. 1) It’s about focusing on the portrait(s) of Jesus that we get through the literary presentations in the New Testament documents. In this way, we learn Jesus not through getting at the historical Jesus that lies behind the texts but the Jesus that we encounter in the texts themselves. 2) It’s about acknowledging the Jesus that is “known and loved in the community of faith not as an object of study but as a personal presence and sustaining power” (23). And these two elements are intertwined through the high importance placed upon church tradition, for the NT documents themselves that show us Jesus were composed by those who believed they knew him as presently alive in Spirit. As Johnson explains, “Their memory of his past was selected and shaped by their continuing experience of him in the present. But by no means did that present experience obliterate or falsify that past; rather the church understood that it saw more truly into who Jesus had been because of who he now was” (24). And these selected and shaped memories are what have been handed down to us in canonical Scripture. Johnson honestly faces the next issue when we consider that the Jesus we encounter in Scripture are based on those decisions on how to write him, and on those decisions that took these writings and established them as authoritative Scripture. “How can we ever know that the decisions made in the past were correct? How could one be sure that the image of Jesus in the four canonical Gospels–so obviously different from that in the Gnostic Gospels–is in fact that true image of Jesus? One cannot know such things with certainty. This risk requires a trust in God that the community meeting in the name of the resurrected Jesus through all these centuries has not fundamentally been misled” (25). 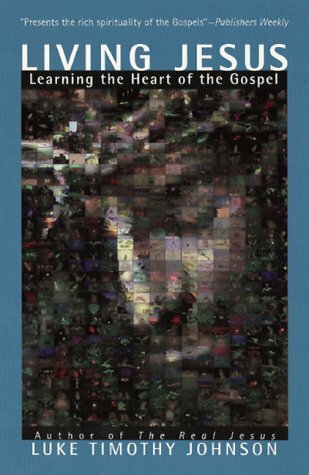 The main part of the book breaks down into two major parts: one is where Johnson discusses learning the living Jesus in worship, in the lives of saints, and in the “little ones of the earth” (i.e., young, poor, weak, lowly). The other main part which is by far the bulk of its pages is Johnson’s close look at the portraits of Jesus found in the various writings of the NT. What is most valuable about following Johnson’s approach here is taking into serious account what he calls the “most basic issue that every reader must inevitably confront, namely the diversity of testimony concerning Jesus” (79). What Johnson means here is that the “compositions simply do not speak with one voice” (79). “none of them alone (nor all of them together) adequate or comprehensively captures the living reality that is Jesus?” (79-80). This is indeed the challenge that you face when coming to the NT for an understanding of Jesus, and the typical response especially in more recent times has been to deny the diversity and produce a unity portrait of Jesus that is actually found nowhere in the NT. Johnson himself chooses the other option, as do I.
I very much agree with his focus on the fact that these are literary traditions, and that we should respect and embrace the diversity of portraits of Jesus that we find within the Bible. We haven’t always been the best at doing this, but we should be! The simplest and most forthright reason being that the church has preserved four different biographies of Jesus within its authoritative canon of Scripture. The efforts of those such as Marcion (who wanted only one Gospel) and those such as Tatian (who produced one big Gospel with all the four mushed together) to reject this diversity among the Gospels were ultimately rejected by the universal church. The church saw the good in diversity when it comes to talking about who Jesus is. The problem with acknowledging diversity, though, clashes with the modern tendency to view truth as only singular. Those Gospel harmonies that are out there go along with this with their mission to do away with the diversity by resolving differences among the accounts. Johnson argues, rightfully in my view, that the issue assumes that the Gospels intend to report mere facts and that a very simple correspondence between facts and report leads us to what the truth actually is. Truth must be singular, not plural. He adds, “Attempts to deny or suppress this rich diversity for the sake of a simple or univocal understanding of Jesus require that violence be done to the very compositions that bear witness to him and interpret him” (199). In other words, we end up with a Jesus that isn’t even represented in the NT but a Jesus of our own making. “Jesus is everywhere associated with faithful obedience toward God and meek, compassionate, and self-emptying service toward other people” (200). While I don’t dismiss an historical approach to the Gospels and Jesus as much as Johnson does, I certainly like his approach here and the points that he makes about taking into serious account who Jesus is according to Mark, according to Hebrews, according to Revelation, etc. We have such a tendency to systematize all the time and put the biblical testimony into manageable little boxes that we miss out on the fact that what we have in the NT asides from history is artistic portrayal, and perhaps even important, the stories of which the larger story of God and his mission in the world is composed. The diverse witness in the NT about who Jesus is portrays for us who Jesus was with much greater depth, mystery, and awe than any singular representation. It presents us with not just a dead figure of the past; it points us with greater resonance to who Jesus is as we surrender ourselves to the “overwhelming reality of the living Lord, who continues to surprise” (32). ← Leviticus says you can murder an animal.